An outdoor advertising company apparently intends to install two giant digital “screens” on an historic building on Hollywood Blvd., even though such signage would run afoul of the city’s ban on new off-site signs as well as restrictions regarding historic buildings. 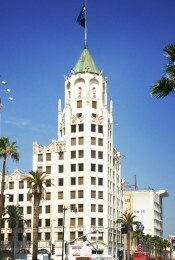 Known as the First National Bank Building, the 13-story building at the corner of Hollywood Blvd. and Highland Ave. is regarded by some preservationists as the most beautiful building in Hollywood. The company, imedia Outdoor, is marketing ad space on two digitized mesh screens on the west and south faces of the art deco structure built in 1927. The signs would be approximately 3,000 and 1,500 sq. ft. respectively. According to a company marketing brochure, there will be a rotation of 6 ads on each screen, changing every 10 seconds, 24 hours a day. One of these ads will cost $45,000 a month, according to the brochure. The company apparently intends to have the screens in operation by March 7, the date of the Academy Awards ceremonies just across the street at the Kodak Theater in the Hollywood & Highland complex. According to city officials, no application has been made for sign permits at that location. In addition, the city adopted a no-exceptions ban on new off-site advertising signs last year. The company’s website features photographs of several unpermitted supergraphic signs in the city. Below is a short video about the history and architecture of the First National Bank Building.